Imagine starting your season alongside world champion Valderde, Spanish stage race hero Landa and stars like Tim Wellens, Marcel Kittel, Fabio Aru, monument winner Dan Martin, Warren Barguil, John Degenkolb and Bauke Mollema. For Max Stedman in 2019, that is just what he will be doing. His team Canyon DHB, winners of the Tour Series in 2018, are already flat stick on the road as they prepare to start their season in the four stage (one dayers) Vuelta Mallorca (31st Jan to 3rd of Feb). Most of the British team are in Calpe for the four race series with many having been there since the 7th of January whilst Max Stedman arrived a little later to the party having landed in Calpe on the 16th. It was when looking at the profiles of the stages for Vuelta Mallorca that I saw the first one, 180km in length and ending in a summit finish up the Puig St Salvador (2nd Cat), that I thought Max would be a good rider to chat to so knowing how Max likes a climber’s race, I gave him a call to find out more. Max explained how the team’s race programme is quite different this season. Normally, they will start at the Perfs Pedal (which they are attending again in 2019) and then not have much until March before it all picks up in April. But this year, the end of January sees them up against world champions and so on in Mallorca. “I look at it as a big opportunity to get a good start to the season whereas others will use it as an early doors race to get up the road or get some race miles in. It will be a bit of a mix with the different ambitions of riders but as a team, we’ll try and get out there and put ourselves on the map early and look to get some early results or guys up the road and get some publicity for the team’s sponsors and get the race miles”. “It will be interesting for me as I’ve done hilly stage races at this level but never done a series of one day races so I am quite looking forward to it and hanging onto the big boys as long as I can. 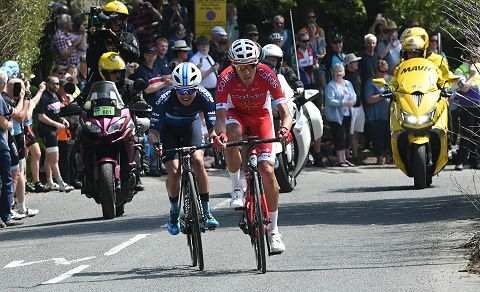 Having done the Tours of Yorkshire and Britain against WorldTour riders gives me confidence having been there or there abouts against some of the world’s best”. 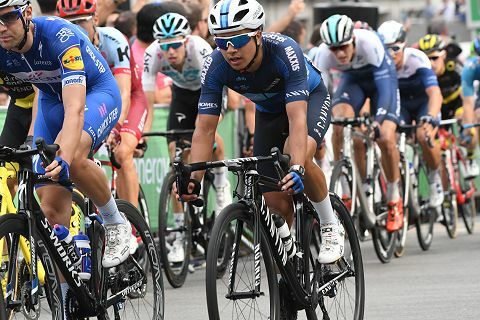 “On Monday, it was more a shake down stuff with the new race bikes (rim brakes on it) making sure my position was alright and so on and then Tuesday we did some FTP stuff and I went for an effort up the Col D’Rates and then today (Wedensday) there was some lead out efforts and we have the Swift race this evening”. Looking further ahead for a season when the team boss Tim Elverson has already explained how the team will do a dual programme, Max says he is hoping that will present him with more opportunities in UCI events with some climbs in them like races in the Ardennes. What events they get to do will depend on invites as teams at this level are at the mercy of the race organisers which makes knowing what races the riders can do much more difficult for managers to confirm than those in WorldTour teams. Max explained the team is looking to race in France, Holland and Belgium early season as they prepare for a busy year including the big races in Britain which may well be important for Tour of Britain qualification but at this point in time, isn’t sure what his programme will be and in what races he will be needed. Max though does expect to be in the Klondike GP (April 14) which is quite a hilly one with the 25% ascent at Saltburn. “I was also happy with the way I tactically played that because I was pretty outnumbered towards the end. I tried to get the numbers down to be more in my favour but it ended up being two JLT and two Madison Genesis with me so it was still hard but it was a good race and I’m looking forward to a few more like that”. 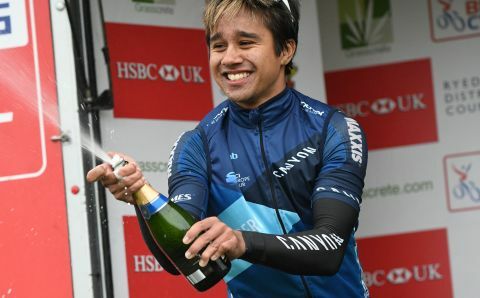 Max is also part of one (Canyon DHB) of three very strong British UCI teams in 2019 after a season which saw a lot of riders not get a ride, something which is still affecting many riders. He says of keeping his place in Tim Elverson’s team “it is really nice to be part of such a strong team this season”. Asked if he feels like part of a changing of the guard as younger riders come through and the older generation retire, he says “I think the young riders coming through is a good thing but you always have to have the experienced riders around to learn how to race and they have the ability to pump out the results as they have had years of having the pressure to do that where as the young guys haven’t”. 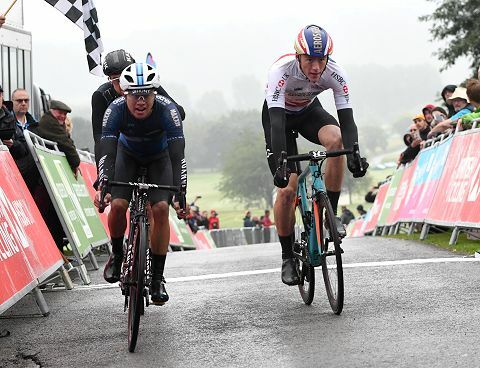 Stage 4, Tour de Yorkshire 2018 – Max Stedman and stage winner Rossetto were away alone, with Stedman leading over the Barden Moor and Goose Eye climbs. But 30km later, on the Côte de Park Rash, the Frenchman – fourth in 2015, left the Brit behind for good. “I started watching racing in the days of the Recycling team with the likes of Rus Downing and there does seem to be a changing of the guard now as teams concentrate on development which is good for the British scene”. The final question was “so how’s the weather Max?” “Windy, sunny and a warm 18 degrees” was the reply adding “we have come out here at the perfect time judging at what is going on at home”. Knowing how one of VeloUK’s clients, Cycling Holiday Spain, run training camps in the area, I can see why it’s a popular one to go to for some miles under the wheels. Good luck to Max and the team in the Vuelta Mallorca!